James Garvin began his career in EMS relatively late in life. Prior to becoming an EMT, James worked for 21 years as a machine operator for a nationally known paper production company. During his employment with the paper company, James became a member of the fire brigade and Emergency Response Team. 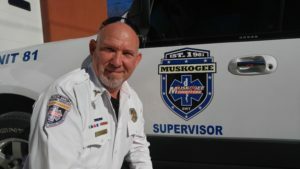 When James retired in 2006, he joined Muskogee County EMS. Since that time, James has furthered his education and is now a Paramedic. In addition to his duties as a field provider, James is also a supervisor, Field Training Officer, a certified CLEET officer, and a tactical medic with the Muskogee Police Department. James has embraced his new career with passion and professionalism. Soon after James started as an EMT, he saw a need to enhance our service’s mapping programs. On his own time and without expectation, James wrote and distributed a 30-page mapping companion that provides simple, easy-to-follow directions to the most obscure streets, avenues, and roads in our county. Even with our current mapping programs, medics still rely on the directions in James’s book when they receive a call for an address on an unknown street. Over the last 10 years with Muskogee County EMS, James has received numerous awards and accolades. Some of James’s many recognitions include EMT-Basic of the Year, Supervisor of the Year, Paramedic of the Year, Employee of the Month, and—most importantly to him— multiple code saves. When asked what he likes most about his job, James is quick to say that it is the satisfaction of knowing he’s helped save someone’s life. “When I get there and they are in cardiac arrest, not breathing, no pulse, and then later they are being discharged from the hospital and sometimes even coming to see you and say ‘Thank you,’ well, it’s just something that can’t be explained. It’s the best thing in the world,” James explained. Each day James exemplifies the standard for Muskogee County EMS in his professionalism, compassion, and exemplary performance. Muskogee County EMS is honored to present James Garvin as an American Ambulance Association Star of Life.